Quoted from papua.antaranews.com, The management of PT Pertamina Marketing Operation Region VIII Maluku-Papua distributed a partnership fund of Rp1.1 billion as a form to support a small and medium business actors in Jayapura. 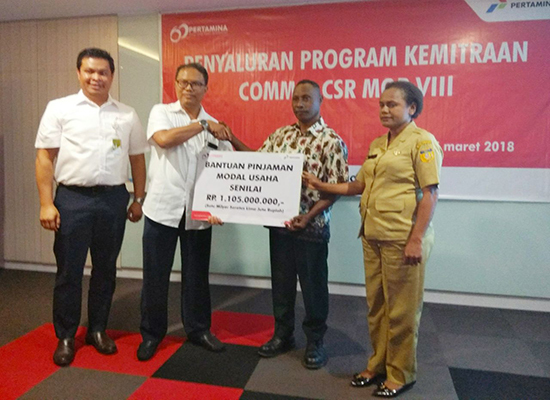 "As the largest state-owned enterprise in Indonesia, Pertamina has two big roles to increase profit in order to improve the welfare of the state, and the second is to carry out social and environmental responsibility," said Pertamina MOR VIII Communication and CSR Unit Manager, Eko Kristiawan, in Jayapura on Monday. The partnership fund is channeled to 25 small and medium entrepreneurs from Jayapura City and District. According to him, in the course of coaching, Pertamina's partners are included in domestic and foreign exhibitions to improve the quality and to compete. Furthermore, it will have an impact on the increase of collectability. "Alhamdulillah on this channeling, 30 percent are those who apply for loan extension to 2-3 times, this is a sign of our coaching is pretty good and sustainable," he said. Eko said that in 2017, Pertamina MOR VIII has channeled a partnership program of Rp 3 billion spread in Papua, West Papua, Maluku and North Maluku Provinces. The Partnership Program is aimed at enhancing the capacity of small businesses of Pertamina's partners to be strong and self-reliant while also impacting the welfare of communities surrounding Pertamina's operations area. One of the small and medium entrepreneurs who participated in Pertamina Partnership Program since several years ago. Sukirman said that the development of small entrepreneurs from Pertamina is helpfully, and he really felt the benefits. "Alhamdulillah I have been following the third program, and my business is growing faster than ever," he said.